Trying to look like the girl that every caveman dreamed of in the prehistoric days? Well, that shouldn't be too hard, now that showering and shaving are common practices. 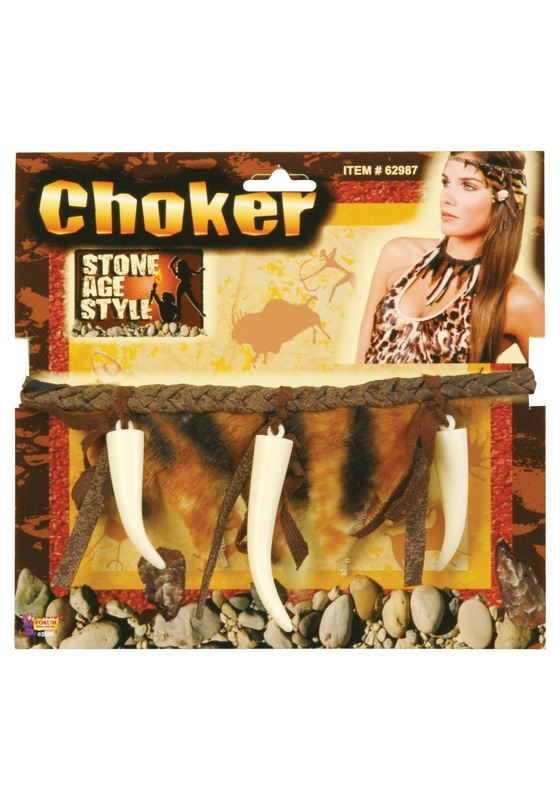 However if you wish to stand apart from all the other women out there looking for their own Freddy Flinstone, maybe you need an accessory that will help you stand out a bit. This Caveman Choker will set you apart from all the other girls trying to seduce their own Neanderthal. Not only will you impress the caveman you have your eyes on with your keen sense of fashion, he will also think of you as an amazing warrior. Once he gets a close up look at the tiger print and the tiger's fangs, he'll instantly have respect for your awesome hunting skills and may even feel intimidated. If that's the case then use that opportunity to ask him out on a date, which back then was basically a good conk on the head and then just drag him back to your cave!